Natural gas is a dirty fossil fuel, not a clean source of energy. The chart below shows the significant greenhouse gas emissions generated by natural gas. 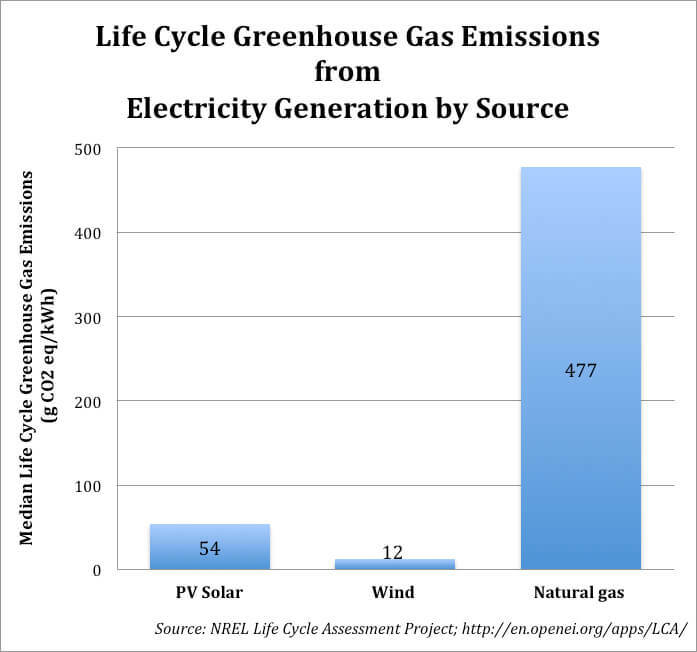 The Life Cycle Assessment (LCA) Harmonization project systematically reviewed estimates of life cycle GHG emissions from electricity generation technologies published between 1970 and 2010. LCAs consider emissions from all stages in the life cycle of an electricity generation technology, from component manufacturing, to operation of the generation facility to its decommissioning, and including acquisition, processing and transport of any required fuels. Thankfully, New Jersey already has one of the lowest levels of emissions in the country, largely because most of the coal generation plants in the state have already closed. However, carbon emissions still increased by 14% in 2014, due largely to increased emissions from natural gas power plants. Emissions aren’t the only problem. Data since 2010 show that natural gas leakage (mostly methane) is even more damaging than carbon dioxide emissions as a greenhouse gas. Methane leakage has a devastating impact since one ton of methane has the same impact on global warming as 84 tons of carbon dioxide in the first 20 years of its release. Our reliance on natural gas presents a serious challenge. To reduce emissions and leakage, we must reduce our use of natural gas and increase reliance on renewables and energy efficiency. In order to reach the goal of drawing 80% of our electricity from renewable sources by 2050, natural gas will by necessity need to be a smaller part of our energy production. Even though our energy future is rapidly shifting, New Jersey continues to build new natural gas power plants and pipelines. A new report from the Union of Concerned Scientists even identifies New Jersey as one of 16 states at high risk of over-reliance on natural gas. See “How does your state stack up?” here. This short-sighted strategy will not only lock in unacceptable levels of greenhouse gas emissions for decades, but also will impose enormous costs on New Jersey ratepayers. 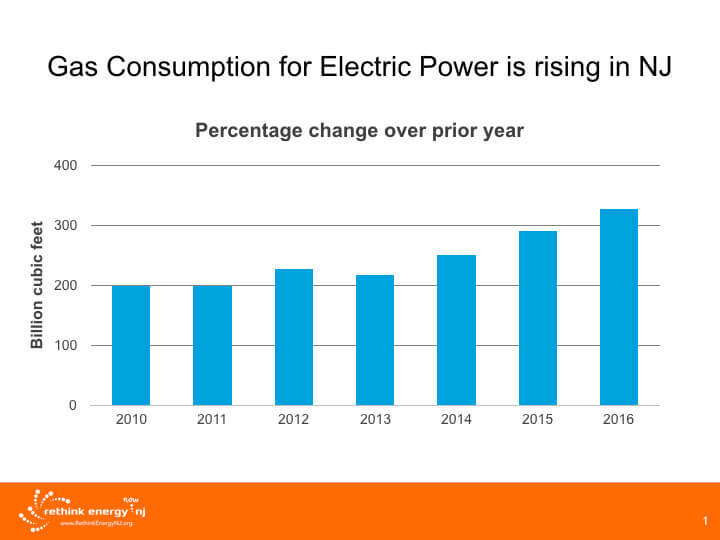 New Jersey is burning more gas than ever for electric generation, leading to a dramatic increase in in-state emissions. In 2016, power plants located in New Jersey burned 51% more gas than in 2013.